Millions of people across Indonesia and the Central Pacific have witnessed a total solar eclipse. Because the eclipse path crossed the International Date Line, in the local time zones it began early on Wednesday, March 9, and ended late on Tuesday, March 8. Different views of the eclipse provided the Astronomy Picture of the Day (APOD) on March 10, 11, and 12: wide angle view, looking down from NASA’s DISCOVR satellite, and a low-resolution flash spectrum. 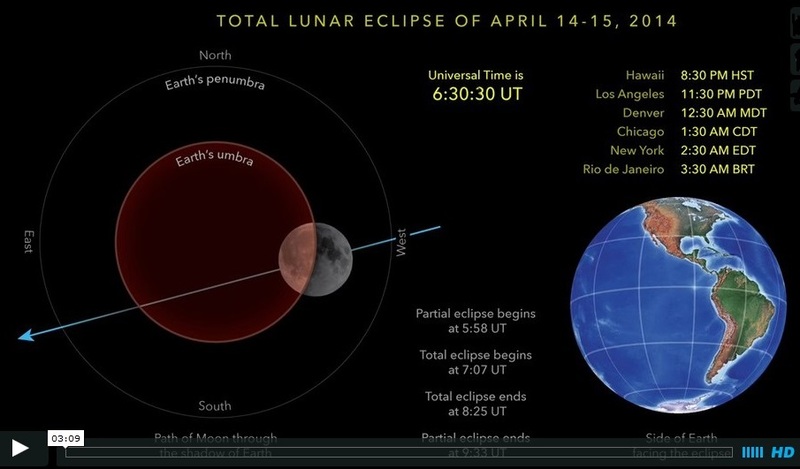 A total lunar eclipse will be visible throughout the continental United States on the night of Monday April 14-Tuesday April 15, 2014. Eclipses of the Sun and of the Moon are discussed in Section 4.2, starting on p. 70. It was made by Michael Zeiler (eclipse-maps.com); Mr. Zeiler accompanied author Jay M. Pasachoff on the expedition to observe the total solar eclipse of November 2013 from Gabon in Africa. The opening partial phase of the eclipse begins about 2 a.m. Eastern Daylight Time, with the total eclipse lasting from about 3:07 am to 4:25 am EDT. The closing partial phase of the eclipse ends at 5:33 am EDT, and will be visible from most of the U.S. and Canada but not from the East Coast. In Pacific Daylight Time, the eclipse is 11 pm partial/12:07-1:25 am totality/-2:33 end. The Astronomy Picture of the Day (APOD) on March 17, 2014, shows warped star trails over Arches National Park, in Utah, USA. The warping effect occurs because the picture is actually a full 360 degree panorama, horizontally compressed to fit your screen. As the Earth rotates, stars appear to circle both the North Celestial Pole, on the left, and the South Celestial Pole, just below the horizon on the right. While the eye-catching texture of ancient layered sandstone covers the image foreground, twenty-meter tall Delicate Arch is visible on the far right, and the distant arch of our Milky Way Galaxy and its dark dust lanes may be seen near the image center. 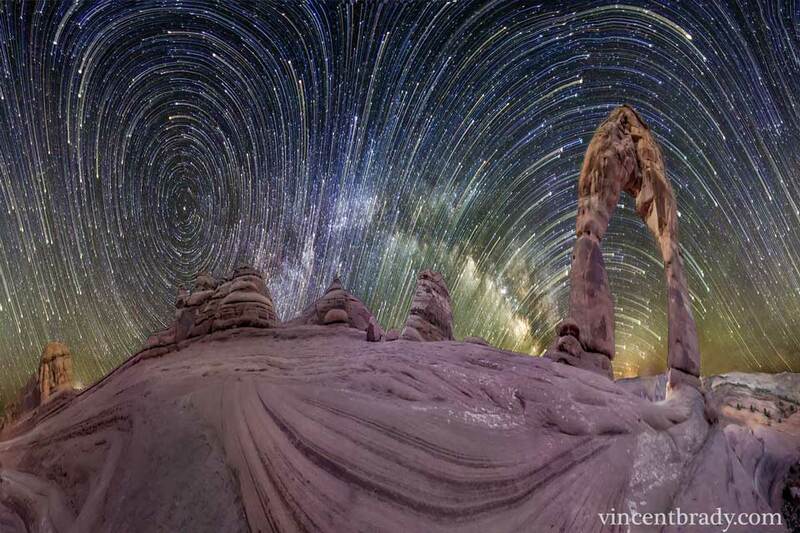 This movie, called “Death Valley Dreamlapse” illustrates the apparent movements of the celestial sphere (caused by Earth’s own rotation) during the course of the night, as (see Figure 4-19). See if you can identify what might be planes, satellites and meteors! Credits: hosted by the LA Times. Shot and edited by Gavin Heffernan. Produced by Sunchaser Pictures.